…I wish I could say that in this new year I have never uttered a single word of negativity but alas I have already failed. A week ago, on an evening after the kids were in bed, I started sobbing. You know, one of those really ugly cries. I was afraid that the enemy and the flesh were right. That all the lies they were telling me were true. I began to say them out loud. I began believing the words coming from my mouth. He sat calmly next to me as my inner child screamed, cried and flailed about. He told me He was there when I was ready to calm down. And when every last word of anger, frustration, selfishness was out I mentally crawled into his lap and melted into his arms. He held me. Cradling me, calming me. Loving me. He wrapped me up tight in his strong arms while tears streamed down His face. He was sad that I was hurting so badly. And wanted nothing more than for me to just surrender fully to Him. Have you struggled with negative thinking lately? Hearing only what the enemy wants you to hear and believe it? Like I had to, it’s time to surrender. Surrender your fears, your anxiety, your frustrations, your selfish desires. 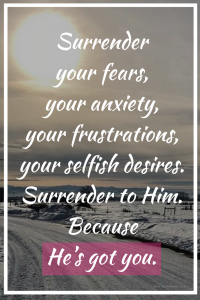 Surrender to Him. Because He’s got you. Take a deep breath. Read the next verse and remember, you are loved. More than you will ever know. Refocus, re-energize, and rethink the words that come out of your mouth. 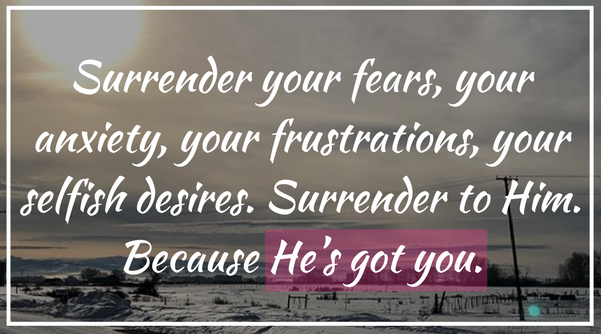 Surrender to Him. He’s got this. Click the button sign up for free books and coffee! Click to Make Mornings Simple!